A recently published collection of essays by Manju Kak represents the artistic, cultural, and spiritual heritage of Nicholas Roerich. Nicholas Roerich was a scholar and practitioner of many disciplines. He pursued art, literature, and spirituality. He was a seeker of knowledge, a guardian of culture, and a purveyor of peace. He has left an oeuvre so vast and varied that a holistic understanding of this heritage requires extensive analysis from multiple perspectives. An anthology of articles ‘Nicholas Roerich: A Quest and a Legacy’ serves this very purpose. This volume of 22 essays by internationally reputed scholars has been edited by eminent writer and art historian Manju Kak. The commentary on Roerich’s legacy is supplemented by rare archival photos and reproductions of paintings from the archives of the Nicholas Roerich Museum, New York, the International Centre of the Roerichs, Moscow, the International Roerich Memorial Trust, Naggar Kullu and from the State Russian Museum, St Petersburg. “The book describes his quest for Russia’s roots, art, involvement with theatre, expeditions, understanding of Shambhala, and works as a peace activist and theosophist,” Kak says. She effectively strings together varied accounts of Roerich’s personality and his quests. It helps that she is herself a trained artist, an interdisciplinary scholar, and shares an affinity to Himalayan ethnography with the great Russian visionary. The book has contributions from historians, curators, disciples, members of Roerich societies, and Buddhist scholars. They speak with the authority and objectivity of subject matter experts as they trace Roerich’s life and work. Suchandana Chatterjee, an expert on Inner Asia, slots him with 19th & 20th century adventurers, colonial agents, and surveyors who were drawn to ‘the Orient.’ She derives ethnographic insights into the region through Roerich’s accounts which were infused with spiritual, artistic, and social enquiry. The Central Asian Expedition in 1924-28 is also the subject for Ruth Drayer who describes the journey across the Gobi Desert. Drayer has previously authored a book on the spiritual journey of Nicholas & Helena Roerich. 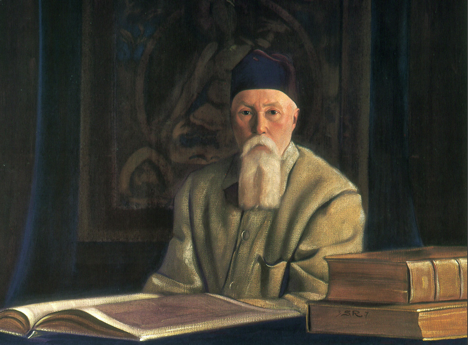 Roerich’s travels honed his vision and resulted in over 7000 paintings and about 30 literary works. Madhavan Palat, a scholar of 19th and 20th century Russian History studies the evolution of his artworks from historical to symbolic. He fused Christian themes into his Pagan sensibilities. In his later worksHimalayan landscapes became the backdrop of his expressions. Lokesh Chandra,a scholar of Tibetan Culture describes the mysticism of his art. Dr. LV Shaposhnikova, Indologistand researcher of Roerich’s heritage, suggests that his paintings demonstrate power of human consciousness to penetrate the fundamental unity of things. “What I admire the most in Roerich’s paintings is the fact that he has not allowed culled knowledge to interfere with what he sees in the Himalayas. It is as if the viewer is looking through a prism. The artist becomes the prism. He doesn’t interpret the mountains for you but presents them as he sees them.” Kak describes the artist’s uncluttered perception of beauty. The Christie’s auction of one of the `Legend’ series at $1.6 million was a benchmark in 2009. Recently `Portrait of Nicholas Roerich in a Tibetan Robe’ by his son Svetoslav created another record auction of $2,994,500. Roerich travelled to study the roots of humanity and those of Russian culture. Chandra describes the search for his motherland’s pagan beginnings in his paintings. “He recognized the ‘minorities’ in the 1900’s. This was at a time when Russians were looking West, especially towards Paris. Roerich stressed that Russia is East,” says Kak. His association with Princess Maria Teneshiva for the experimental village Talashkino is explained in Palat’s essay. Roerich’s works were steeped in spirituality. Buddhist scholars like Tashi Paljor, Andrea Leseries, and Ven. Lama Duboom Tulku explain his interpretation of Shambhala. Leseries describes the concept of luminosity—a quality of pure mind par excellence in Roerich’s paintings. Lama Tulku finds an echo of Tibetan teachings in his art. The most influential of Roerich’s legacy is his contribution towards global peace. ‘The Roerich Pact’ was the first international treaty for protection of cultural heritage in troubled times. It preceded the 1954 Hague Convention. Kenneth Archer and Marga Koutsarova inform about the genesis of Pax Cultura and the Banner of Peace in their articles. Roerich’s teachings of Living Ethics are the subject for Marina Bernardi. She is a practitioner of Agni Yoga and in-charge of the centre in Crookety House in Kalimpong which was the last residence of Helena Roerich. Michael Chiryatev, Trustee if Roerich Memorial Trust, India explains Roerich’s vision for the Himalayan Research Institute. ‘Urusvati’—meaning the ‘light of the morning sun,’ was meant to be an amalgamation of traditional and modern knowledge, principled on natural sciences and humanitarian disciplines. The collection of scholarly writings also includes a firsthand account by Sina Fosdick who was one of the Roerichs’ closest colleagues and a participant in Altai and Mongolia parts of the Central Asian expedition. The volume provides a thorough and credible appreciation of all aspects of Roerich’s quest and legacy. In the context of the increased worldwide interest in this multifaceted man and the complex nature of contemporary reality the book is certainly an informative and credible source of reference. The inclusion of the photographs and paintings makes it a collector item as well.